3. Cf. Hentrich-Von Moos, Petitiones de Assumptione Corporea B. Virginis Mariae in Caelum Definienda ad S. Sedem Delatae, 2 volumes (Vatican Polyglot Press, 1942). 5. The Bull Ineffabilis Deus, in the Acta Pii IX, pars 1, Vol. 1, p. 615. 6. The Vatican Council, Constitution Dei filius, c. 4. 8. Vatican Council, Constitution Pastor Aeternus, c. 4. 9. Ibid., Dei Filius, c. 3. 10. The encyclical Mediator Dei (Acta Apostolicae Sedis, XXXIX, 541). 16. Responsa Nicolai Papae I ad Consulta Bulgarorum. 17. St. John Damascene, Encomium in Dormitionem Dei Genetricis Semperque Virginis Mariae, Hom. II, n. 14; cf. also ibid, n. 3. 18. St. Germanus of Constantinople, In Sanctae Dei Genetricis Dormitionem, Sermo I. 19. The Encomium in Dormitionem Sanctissimae Dominae Nostrate Deiparae Semperque Virginis Mariae, attributed to St. Modestus of Jerusalem, n. 14. 20. Cf. St. John Damascene, op. cit., Hom. II, n. 11; and also the Encomium attributed to St. Modestus. 23. Song 3:6; cf. also 4:8; 6:9. 26. Amadeus of Lausanne, De Beatae Virginis Obitu, Assumptione in Caelum Exaltatione ad Filii Dexteram. 28. St. Anthony of Padua, Sermones Dominicales et in Solemnitatibus, In Assumptione S. Mariae Virginis Sermo. 29. St. Albert the Great, Mariale, q. 132. 30. St. Albert the Great, Sermones de Sanctis, Sermo XV in Annuntiatione B. Mariae; cf. also Mariale, q. 132. 31. St. Thomas Aquinas, Summa Theol., I, lla; q. 27, a. 1; q. 83, a. 5, ad 8; Expositio Salutationis Angelicae; In Symb. Apostolorum Expositio, a. S; In IV Sent., d. 12, q. 1, a. 3, sol. 3; d. 43, q. 1, a. 3, sol. 1, 2. 32. St. Bonaventure, De Nativitate B. Mariae Virginis, Sermo V.
34. St. Bonaventure, De Assumptione B. Mariae Virginis, Sermo 1. 35. St. Bernardine of Siena, In Assumptione B. Mariae Virginis, Sermo 11. 37. St. Robert Bellarmine, Conciones Habitae Lovanii, n. 40, De Assumption B. Mariae Virginis. 38. Oeuvres de St. Francois De Sales, sermon for the Feast of the Assumption. 39. St. Alphonsus Liguori, The Glories of Mary, Part 2, d. 1. 42. St. Peter Canisius, De Maria Virgine. 43. Suarez, In Tertiam Partem D. Thomae, q. 27, a. 2, disp. 3, sec. 5, n. 31. 45. Rom 5-6; I Cor. 15:21-26, 54-57. 47. The Bull Ineffabilis Deus, loc. cit., p. 599. 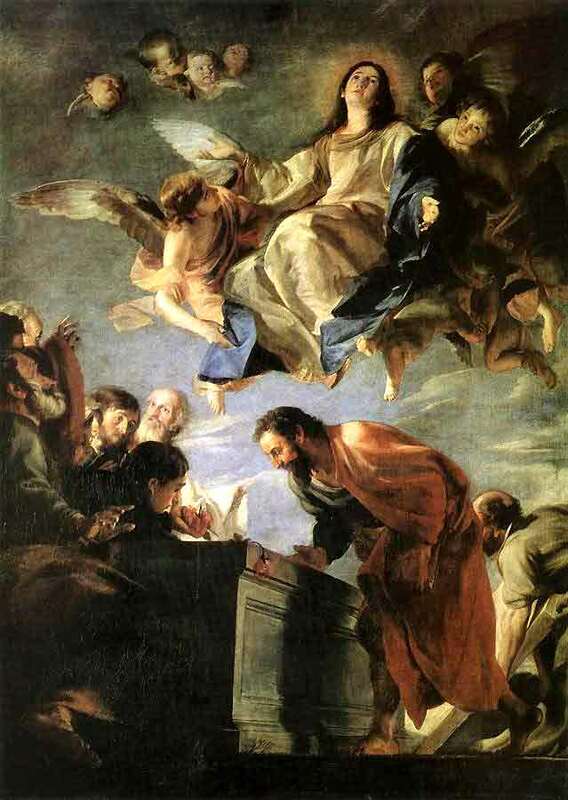 That is a beautiful portrait of the Assumption of Mary.